Two major problems I have experienced with Ubuntu on a laptops are heating up and battery drainage. Most of the modern day devices have the capability to save power. 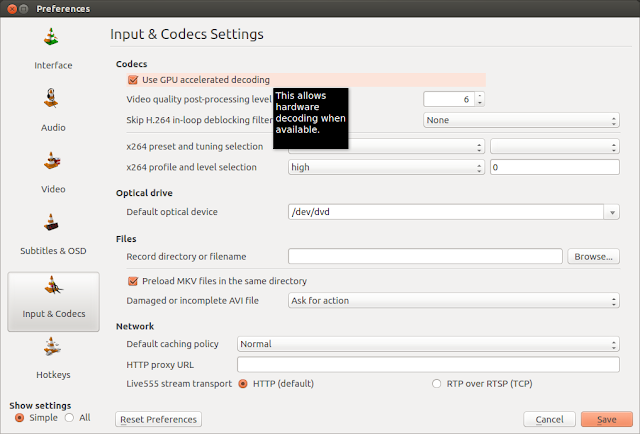 The drivers installed on the Ubuntu has the capability to do that also. But they are underutilized. This results in the dual problems of heavy battery drain and heating up. These two problems are interrelated and they can be solve together by doing some manual configurations. The following methods were successfully tested in three hp laptops ( The laptops used processors: AMD A10 with ATI dual graphics, i5 with Intel and ATI dual graphics and Dual Core without graphics card). 1) The first and most important solution to the problem is TLP. (Thanks to my friend who told me about this.) TLP is an advanced power management tool for Linux. It is a pure command line tool with automated background tasks and does not contain a GUI. Before installing TLP you should remove any scripts you have already added for power saving (e.g. : in /etc/rc.local) and purge the laptop-mode-tools if installed ("sudo apt-get purge laptop-mode-tools"). TLP applies the following settings depending on the power source (battery / ac): Kernel laptop mode and dirty buffer timeouts; Processor frequency scaling including "turbo boost" / "turbo core"; Power aware process scheduler for multi-core/hyper-threading; Hard disk advanced power management level and spin down timeout (per disk); SATA aggressive link power management (ALPM); PCI Express active state power management (PCIe ASPM) – Linux 2.6.35 and above; Runtime power management for PCI(e) bus devices – Linux 2.6.35 and above; Radeon KMS power management – Linux 2.6.35 and above, not fglrx; Wifi power saving mode – depending on kernel/driver; Power off optical drive in drive bay (on battery). sudo gedit /etc/default/tlp Parameters General hints: Parameters ending on _AC are effective with the power supply connected Parameters ending on _BAT are effective when running on battery Parameters containing blanks must be enclosed in double quotes ("") Some parameters are inactive by default; remove the leading '#' to activate 0.) General TLP_ENABLE=1 Set to 0 to disable TLP (Reboot needed), It should be enabled so leave the default value 1.) File System DISK_IDLE_SECS_ON_AC=0 DISK_IDLE_SECS_ON_BAT=2 DISK_IDLE_SECS_ON_BAT=2 = You can either leave the default value (2) or you can edit it as 5, By default Ubuntu uses 5, its up to you. This controls how agressive the system is at trying to avoid writing to disk. The longer the disk is idle, the more power you can save. This is only active on battery power, and it restores these values to kernel defaults when on AC power. Defaults 5, which enables laptop mode and forces the system to wait 5 seconds whenever something asks to write to disk to flush out as much data as we can. 2.) Dirty page values MAX_LOST_WORK_SECS_ON_AC=15 MAX_LOST_WORK_SECS_ON_BAT=60 Leave the default value, Defaults 60, which means that the kernel will not start forcing process to write out file information that has been changed but not saved until 60% of usable system memory is filled with dirty information. 3.) Processor and Frequency Scaling The default Ubuntu cpu frequency config can be deleted by running the folowing command: sudo update-rc.d -f ondemand remove This is not a general prerequisite for TLP but is only needed if the user decides to change the default governor. If a user issues the command without changing the TLP setting too, he ends up with "perfomance", which is quite bad for battery life. CPU_SCALING_GOVERNOR_ON_AC=ondemand CPU_SCALING_GOVERNOR_ON_BAT=powersave Remove the hash and edit it as conservative. Its up to you what you want, you can also use ON_BAT=powersave. Select a cpu frequency scaling governor: ondemand/powersave/performance/conservative. The governor decides what frequency should be used. ondemand Dynamically switch between CPU(s) available if at 95% cpu load performance Run the cpu at max frequency conservative Dynamically switch between CPU(s) available if at 75% load powersave Run the cpu at the minimum frequency TLP Developers suggest using "conservative" over "powersave – especially on AC – should not be a general recommendation but only an option for hardware that produces excessive heat or fan noise. 4.) Min/Max frequency #CPU_SCALING_MIN_FREQ_ON_AC=0 #CPU_SCALING_MAX_FREQ_ON_AC=0 #CPU_SCALING_MIN_FREQ_ON_BAT=0 #CPU_SCALING_MAX_FREQ_ON_BAT=0 Set the min/max frequency available for the scaling governor.Possible values strongly depend on your cpu. For available frequencies see tlp-stat output. These parameters are disabled by default, remove the leading # to enable them, otherwise kernel default values are used. 5.) Turbo Boost CPU_BOOST_ON_AC=1 CPU_BOOST_ON_BAT=0 Set the cpu "turbo boost" feature: 0=disable / 1=allow ,Requires an Intel Core i processor and kernel 3.7 or later. This may conflict with your distribution's governor settings, A value of 1 does not activate boosting, it just allows it. 6.) Cpu Cores/Hyper-Threads SCHED_POWERSAVE_ON_AC=0 SCHED_POWERSAVE_ON_BAT=1 Minimize number of used cpu cores/hyper-threads under light load conditions 7.) Kernel NMI_WATCHDOG=0 Activate kernel NMI watchdog timer (0 = disabled/save power, 1=enabled). A value of 1 is relevant for kernel debugging only. 8.) Hard disk advanced power management level DISK_APM_LEVEL_ON_AC="254 254" DISK_APM_LEVEL_ON_BAT="128 128" Set the "Advanced Power Management Level". Possible values range between 1 and 255: 1 – max power saving / minimum performance Important: this setting may lead to increased disk drive wear and tear because of excessive read-write head unloading (recognizable from the clicking noises) 128 – compromise between power saving and wear (TLP standard setting on battery) 192 – prevents excessive head unloading of some HDDs 254 – minimum power saving / max performance (TLP standard setting on ac) 255 – disable APM (not supported by some disk models) Different values for multiple disks are separated with blanks. 9.) Disk I/O Scheduler #DISK_IOSCHED="cfq cfq" Select io scheduler for the disk devices: noop/deadline/cfq (Default: cfq) Separate values for multiple devices with spaces. noop is often the best choice for memory-backed block devices (e.g. ramdisks) and other non-rotational media (flash) where trying to reschedule I/O is a waste of resources deadline is a lightweight scheduler which tries to put a hard limit on latency cfq tries to maintain system-wide fairness of I/O bandwidth 10.) SATA aggressive link power management (ALPM): min_power/medium_power/max_performance SATA_LINKPWR_ON_AC=max_performance SATA_LINKPWR_ON_BAT=min_power ALPM - Aggressive Link Power Management (ALPM) is a mechanism where a SATA AHCI controller can put the SATA link that connects to the disk into a very low power mode during periods of zero I/O activity and into an active power state when work needs to be done. Tests show that this can save around 0.5-1.5 Watts of power on a typical system. 11.) PCI Express Active State Power Management (PCIe ASPM): ( default/performance/powersave ) Hint: needs kernel boot option pcie_aspm=force on some machines PCIE_ASPM_ON_AC=performance PCIE_ASPM_ON_BAT=powersave 12.) Radeon graphics clock speed (profile method): low/mid/high/auto/default auto = mid on BAT, high on AC; default = use hardware defaults (Kernel >= 2.6.35 only, not with fglrx driver! #RADEON_POWER_PROFILE_ON_AC=high #RADEON_POWER_PROFILE_ON_BAT=low 13.) WiFi power saving mode 1=disable/5=enable (Linux 2.6.32 and later, some adapters only!) WIFI_PWR_ON_AC=1 WIFI_PWR_ON_BAT=5 14.) Disable wake on lan Y = Yes , N = No WOL_DISABLE=Y 15.) Audio power saving for Intel HDA Enable audio power saving for Intel HDA, AC97 devices (timeout in secs). A value of 0 disables / >=1 enables power save. SOUND_POWER_SAVE=1 Disable controller too (HDA only): Y/N SOUND_POWER_SAVE_CONTROLLER=Y 16.) Power off optical drive in UltraBay >> (ThinkPads only) Set to 1 to power off optical drive in UltraBay (ThinkPads only), when running on battery. A value of 0 disables this Feature (Default). Drive can be powered on again by releasing (and reinserting) the eject lever or by pressing the disc eject button on newer models. Note: an UltraBay hard disk is never powered off. BAY_POWEROFF_ON_BAT=1 Optical drive device to power off (default sr0) BAY_DEVICE="sr0" 17.) Runtime Power Management for pci(e) bus devices RUNTIME_PM_ON_AC=on RUNTIME_PM_ON_BAT=auto Runtime PM for all pci(e) bus devices RUNTIME_PM_ALL=1 Runtime PM for all pci(e) bus devices: 0=disable / 1=enable, Warning: experimental option, could cause system instabilities some times my usb mouse dongle didn't work when i plug it in usb 3 port, work fine when i plug it in usb 2 port, and all my usb 3 devices are working properly no issue. 18.) Usb autosuspend Set to 0 to disable/1 to enable usb autosuspend feature USB_AUTOSUSPEND=1 19.) System Start and Shutdown RESTORE_DEVICE_STATE_ON_STARTUP=0 Restores radio device state (builtin bluetooth, wifi, wwan) from previous shutdown on system startup: 0 – disable, 1 – enable DEVICES_TO_DISABLE_ON_STARTUP="bluetooth wifi wwan" Disables builtin radio devices upon system start: wifi – Wireless LAN wwan – Wireless Wide Area Network (UMTS) Multiple devices are separated with blanks. I have an error that my Blue tooth device is not Disabled on start up, so if you face this problem just do the following config. sudo nano /etc/rc.local And add the following line before exit 0 rfkill block bluetooth After changing the settings save and exit and then reboot the system for the changes to be effective. 2) CPU frequency scaling enables the operating system to scale the CPU frequency up or down in order to save power. CPU frequencies can be scaled automatically depending on the system load, in response to ACPI events, or manually by userspace programs. CPU frequency scaling is implemented in Linux kernel, the infrastructure is called cpufreq. Since kernel 3.4 the necessary modules are loaded automatically and the recommended ondemand governer is enabled by default. But you can take control of your cpu frequency and can run on low frequency when you dont need much computational power. This can be done by installing indicator-cpufreq. This indicator will allow you to take control of cpu frequency. There are 4 default governers available in the program : Conservative, Ondemand, Powersave and Performance. In addition it will show various frequencies to which the processor can be adjusted manually. This is done by TLP also but you can have a better control using from the GUI by adding this indicator. 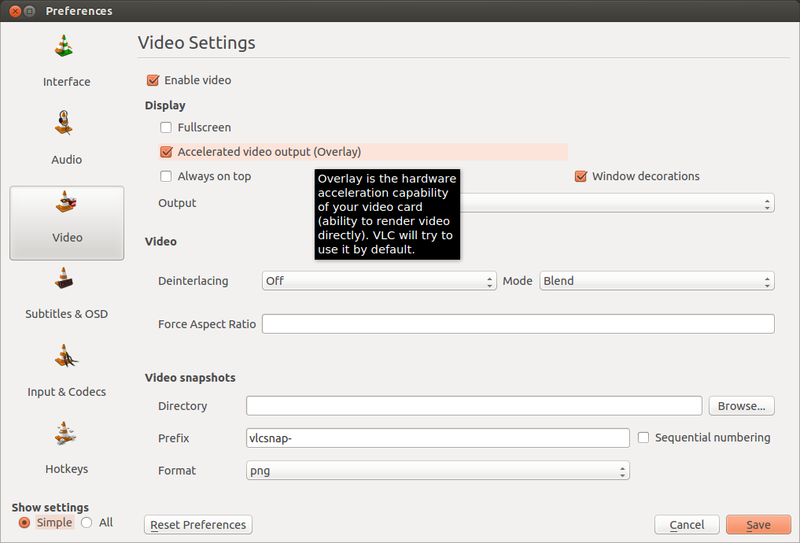 The settings for smplayer can be changed by going to Option tab > Preferences, on the Video tab > General Video > Output driver set the video output driver to "vaapi" as shown here. These tweakings can reduce the heating problem to a great extent and improve the battery life very much.